Dowoti Desir, Executive Director of The Malcolm X and Dr. Betty Shabazz Memorial and Educational Center, describes the history of the Audubon Ballroom from its construction in 1912. The Audubon Ballroom included a theater as well as meeting halls. Many labor, political, and religious groups met there, including Malcolm X’s Organization of Afro-American Unity. The site now boasts the Malcolm X and Dr. Betty Shabazz Memorial and Educational Center, where three multi-media kiosks provide the largest exhibit on Malcolm X in the world. 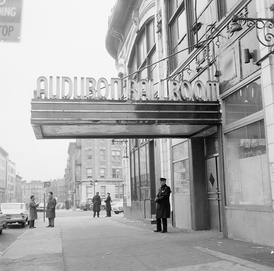 Best known as the place where Malcolm X was assassinated on February 21, 1965, the Audubon Ballroom has long been a center of African American social and political activity. 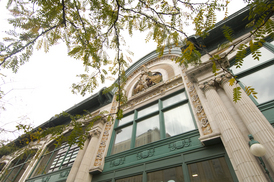 Located at 3940 Broadway between 165th and 166th Streets in the Washington Heights section of Manhattan, the theater was developed by William Fox, a Hungarian immigrant who founded the Fox Film Company in 1915. Designed by Thomas Lamb, one of the leading theater designers of the time, the building’s Broadway façade featured a three-dimensional terra cotta boat with the head of Neptune, based on the mythical ship Argo of Jason and the Argonauts fame. The ballroom, located on the 2nd floor, served as a venue for a number of important historical events, such as the meeting place for the Municipal Transit Workers Union. 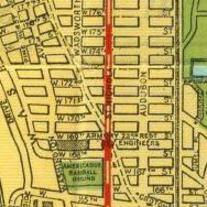 It also was the venue for the annual New York Mardis Gras festival, when a King and Queen of Harlem were crowned. More recently the site has been controversial because of a plan by the Columbia Presbyterian Medical Center, which purchased the property from the city of New York, to raze it and build a medical research center. African Americans protested the demolition and a compromise was reached, whereby part of the original building would remain and a memorial to Malcolm X would be created. A statue of Malcolm X now stands in the Broadway lobby. In 1997, David Graves, a California artist, created a 12-by-63-feet mural to honor Malcolm X’s achievements. Dowoti Desir, Executive Director of The Malcolm X and Dr. Betty Shabazz Memorial and Educational Center, describes the role Dr. Betty Shabazz played in preserving the Audubon as a historic site. The site now boasts the Malcolm X and Dr. Betty Shabazz Memorial and Educational Center, where three multi- media kiosks provide the largest exhibit on Malcolm X in the world.